Each core element is explained in detail with examples on its own page under the Works Cited Entries Core Elements drop-down menu. Created by our Writing Tutors in the Learning Commons. The Purdue Online Writing Lab MLA Formatting and Style Guide provides guides for several common writing styles including MLA. The Sample Paper can be quite instructive. The MLA Style Center from the Modern Language Association. There's nothing like going straight to the source. 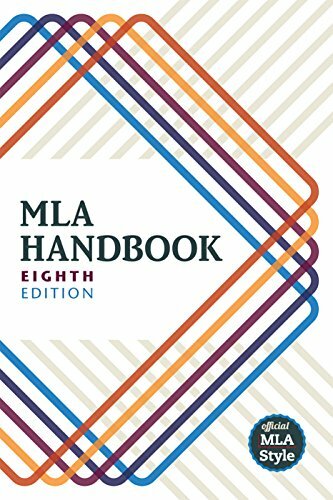 The standard citation style guide for the humanities, especially languages and literature, is the MLA Handbook, 8th edition, 2016. The Modern Language Association of America (MLA) publishes the manual. It is commonly referred to it as the "MLA Manual" or the "MLA Handbook." 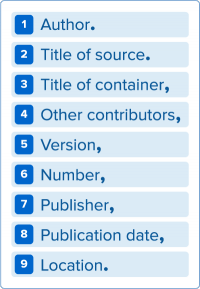 Information about the sources you use in your work is included as a separate list at the end of the paper. The MLA Handbook suggests using the title "Works Cited" for the list. Any source information that you provide in an in-text citation must correspond to a source on your Works Cited page. For sources with three or more authors, list the first author's name followed by ", et al." Journal volumes and issues are now formatted: "vol. 12, no. 3." If a journal issue includes a publication month or season include that in the publication date, like: "Spring 2016," or "Jan. 2016." In the Works Cited entry "p." is used before citing a page number, and "pp." is used before citing a page range. These are not used in the in-text citation. Refer to the MLA Handbook for authorized examples of citations. Some of the citations in this guide are taken from the MLA Handbook; others are recommendations from librarians. Your instructor may have specific directions pertaining to your assignment. A copy of this manual is available in the Dora Badollet Library. This guide is adapted with permission from MLA Style Guide, 8th Edition LibGuide by Angie Neely-Sardon, Indian River State College. It is licensed under a Creative Commons Attribution-NonCommercial-ShareAlike 4.0 International License.